The Ovarian Cancer Research Fund’s 17th annual Super Saturday benefit hosted by Kelly Ripa and Donna Karan. Raised an impressive $3.5 million for ovarian cancer research on Saturday in July 26 at Nova’s Ark Project in Water Mill, NY. Classic photo booth LLC provided the vintage non digital photo booth for Super Saturday Fundraising in Hampton, NY. Also we proud to say that our photo booth was very popular at the event. The high-profile Hamptons fundraiser, sponsored by QVC, is a luxury shopping and family activity event. Also that boasts a one-of-a-kind designer garage sale, kids’ carnival, luxury raffle and gourmet food. Therefore to raise funds for ovarian cancer research, guests are able to shop the fashion garage sale. Which includes merchandise from over 200 major designers. Such as Donna Karan, Ralph Lauren, INTERMIX, Vince, IRO Also Alexis Bittar, Bonpoint, Haute Hippie, Nanette Lepore, Milly. Also Theory, Elie Tahari, Diane von Furstenberg, alice + olivia, Scoop NYC, Vilebrequin. As expected, the fundraiser attracted a long list of celebrities. Including Alec Baldwin, Hilaria Baldwin, Rachel Zoe, Star Jones, Lisa Rinna, Kelly Rutherford. Also Gayle King, Jill Martin, Joe Zee, Chef Janine Booth, Katie Lee, Beth Stern, Nanette Lepore, June Ambrose. As well Fern Mallis, Ali Wentworth, Ben Shenkman. And Adam Pally, Cameron Silver, Kathy Hilton, Nicky Hilton, Vita Sidorkina. Jonathan Cheban, Judy Giuliani, Cathy Moriarty-Gentile, Joy Behar, and Beth Shak. Last year, Super Saturday also raised $3.5 million. Read last year’s recap here. First of all his year’s Fundraising event benefit was packed with Hamptonites and A-Listers on July 27. But, in the midst of all the celebrity action, the event raised an incredible $3.5 million for ovarian cancer research. So Long-awaited by East End fashionistas, Super Saturday’s ultra-luxury designer “garage sale” was a major hit this year. As a result guests scoured the sale for sought-after fashion finds by over 200 top designers. assisting you with your special day! 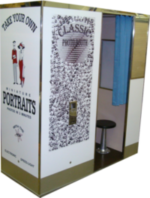 Classic Photo Booth Rental in Forbes.